Lance Cpl. 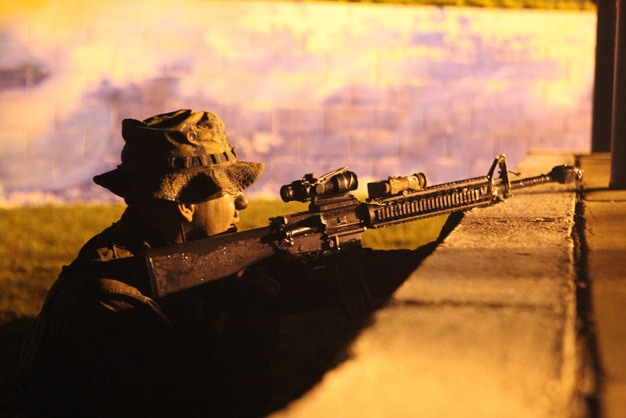 Alejandro Carbajal, scout swimmer and rifleman with Company A, Battalion Landing Team 1st Battalion, 4th Marines, 31st Marine Expeditionary Unit, scouts ahead before the primary raid force lands on the shoreline during a small boat raid here, March 17, 2012. The raid was conducted during the MEU’s Certification Exercise, which upon completion certifies that the MEU is capable to respond to any scenario that may arise. The 31st MEU is the only continuously forward-deployed MEU and is the nation’s force in readiness in the Asia-Pacific region. Photo by Lance Cpl. Michael S. Oxton.